Politicians love to claim that they have the pulse of the people and speak for them when in fact most of them speak on behalf of the wealthy and the lobbyists. Kentucky Republican Andy Barr invited congresswoman Alexandria Ocasio-Cortez to visit his home district and talk to the coal miners there about the impact her Green New Deal would have on their livelihood. No doubt Barr felt that she would be afraid to meet with real Merkins because only Republicans speak for them. But to his surprise, she accepted and tweeted that she looked forward to persuading his voters that it was she who was best representing their needs and interests and not Barr. I have long held that the only economic measure that matters in the US is the stock market. While other measures such as unemployment and wage rates, income and wealth inequality, health and education measures, housing and rental prices and the like may have much greater significance for the vast majority of people, the oligarchy only cares about the value of their stock portfolio. As long as the stock market rises at a healthy clip, champagne corks will be popping even as climate change threatens to destroy the world. To the consternation of the Democratic party establishment and the mainstream media, Bernie Sanders is once again proving that he has strong support, both in terms of getting large numbers of volunteers signed up and in small donations. The party establishment hates him because he is not part of the neoliberal wing that encompasses the Clintons, Barack Obama, and Joe Biden, plus many of the other contenders for the party’s presidential nomination. Sanders and Warren are the two people who are taking direct aim at the control by the oligarchy of pretty much all the major institutions of American political and economic life. Apparently information about land ownership in England is shrouded in secrecy and not easy to ferret out. Now we know why. 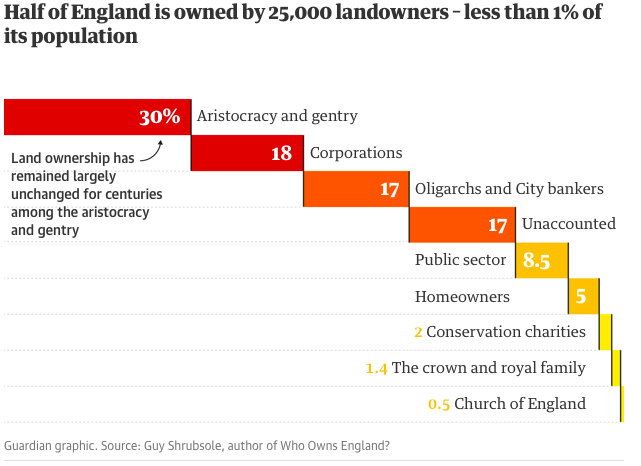 A new book by Guy Shrubsole reveals that half of all the land in England is owned by just 25,000 people or just 1% of the population.